Average triangles measure 6-8 inches. For a brighter sound, a smaller triangle may be a better choice (not necessarily for playing soft). For a darker sound, a larger triangle may be a better choice (not necessarily for playing loud). A selection of triangle beaters that vary in size (diameter) should be available. 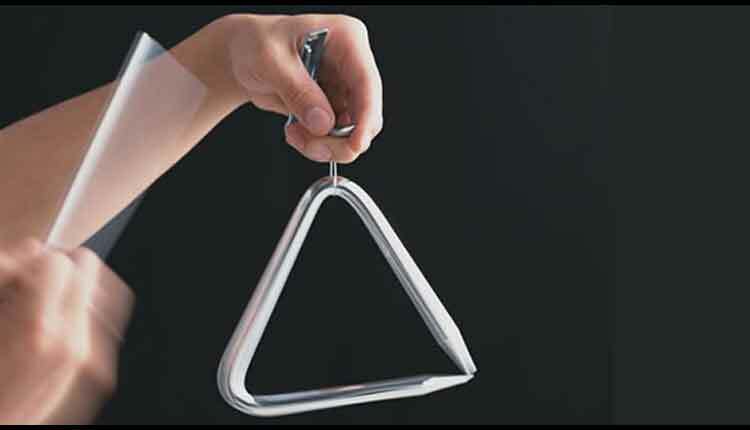 Small triangle beaters are used for a brighter sound and for a better articulation of certain rhythmic passages (not necessarily for the playing of soft passages). Triangle clips should easily clip to a music stand. Clips should be strung with a thin cord, preferably made of nylon. Two loops should be made so one can act as a backup if the other breaks. The thumb and first finger of the hand should form the shape of the letter “C.” The clip should then drop into the “C” so that it rests on top. Use this technique for slow to moderate rhythmic passages and long note values. For a thin texture and less resonance, play the triangle on the outside near the top (A) or on the inside of the base near the closed end (B). Play on the outside near the bottom for a full texture and resonance (C). Place the beater inside the triangle and move back and forth between the two sides for a thin sound (D). Play between the base and the closed side of the triangle for a full sound (E). Suspend the triangle from two clips with the closed side on top; play with a pair of matched beaters. The most reliable method for playing grace notes is to use two matched beaters. Play on the base of the triangle if suspended from one clip. Play on the closed side if suspended from two clips. Use single strokes on all grace note figures. Hold the triangle as if playing single notes. Place the beater between the two sides at the top or between the base and the closed side. Move the beater back and forth to create a smooth, sustained sound. Suspend the triangle from two clips. Play on the closed side using a single stoke roll to create a smooth, sustained sound. A general rule for dampening the triangle is to let everything ring unless there are obvious unison staccato notes. Listen and emulate the musical interpretation of the ensemble. The triangle is dampened by squeezing the remaining three fingers of the holding hand into the heel of the hand.